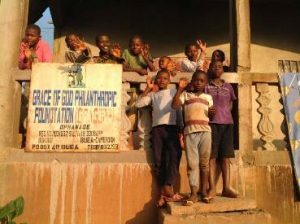 This is a Project put in place by Rising Hope Foundation for Change(RHFC) to celebrate Christmas with the least privileged in their various institutions for example in an orphanage, Handicapped centres, Girls institutions, prisons and other depending on the decision of the board for that year. The main objective of this project is to Put hope, happiness and smiles on their faces of the least privileged during this period of Love. Christmas is a religious and cultural day meant to celebrate the birth of Jesus Christ. Both Christians and non-Christians engage in this celebration because it has grown in popularity over the years as a time to make merry and to be with loved ones. During Christmas celebrations, it is common for various families to have meals together and to share in the giving of gifts. RHFC also remember the less fortunate in society by providing things such as food, clothing, medication and shelter to those who may not be able to afford them. There is never enough love for the human heart, especially for a childs’ heart. We always need love and often come short of it. It’s something as important as air, as life itself. 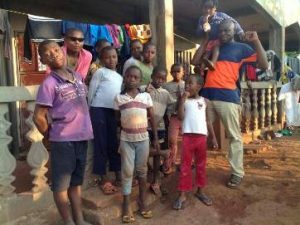 And it is You who help us to give love of the Lord Jesus to orphans….This project will be a yearly event and this year is the first of it kind. 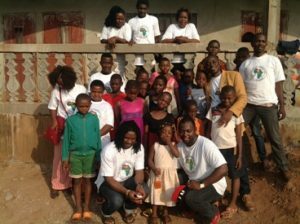 The first visit to the orphanage was on Saturday 12th December 2015. The purpose of this visit was to get first hand information about the orphanage such as the number of children, nature of the structure hosting them and to understand the day to day challenges they face. The first observation was that they had relocated from a temporary site which they had been renting to a permanent site on a hill slope still under construction. It was revealed to us that there are 28 of them with 14 boys and 14 girls ranging within the ages of 6 and 23.They all attended school some in the primary, secondary, high school and the university of Buea. -It was evident that the children were barely managing to cope with life. 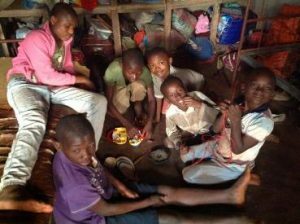 The incomplete permanent structure was small to conveniently accommodate the number of children hence overcrowding in some dormitories. -They lacked adequate bedding facilities. -There was no available pipe borne water facility nearby by hence the bigger children (mostly girls) have to cover a long distance to a nearby spring to fetch drinking water and for laundry. -50 kg of rice, a carton of sugar, some bathing soap and detergents for laundry, a carton of fresh fish, a bag of salt, two dozens of toilet tissues, a carton of processed tomatoes and cash of FCFA 50,000. Mme. Ebane Nsume Mary thanked RHFC for the marvelous gesture and prayed that the spirit continues in the years ahead even with other similar institutions for God’s glory. 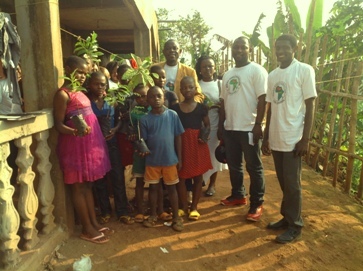 Next was a tree planting exercise of some fruit and ornamental trees provided by Green Earth Foundation Cameroon (GrEFCam) we say thank you for this great partnership. 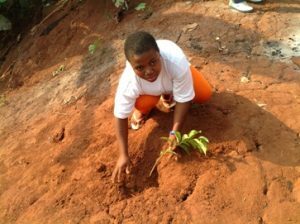 The species included the jack fruit, sour sop, African apples, avocado pear, maesopsis eminii and some moringa oleifera seedlings. The Children then planted these trees around the orphanage with the hope that in the nearest future they will start harvesting fruits from these trees thus fighting against hunger, improve their nutrition, source of income to the orphanage and more importantly encouraging food security. By and large, the visit was a great success and it is hoped that in subsequent years, greater support will be given to this orphanage such as assisting financially in the completion of their permanent structure, providing scholarships to the children and linking the orphanage to other foreign philanthropic organizations that could give them and others we(RHFC)are partners with a long term support. 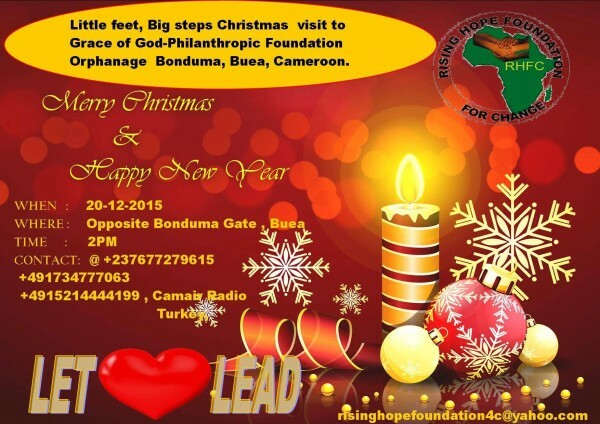 For the year 2016, RHFC will celebrate LITTLE FEET, BIG STEPS CHRISTMAS VISIT(Project) at the Centre of the Deaf and Dumb in Buea. Join us let’s make this day memorable as we share with our brothers and sisters.